Because my anchor charts have been so popular, I wanted to do a quick post with one of my latest ones that I did for 2 column notes for responding to reading. I've been working on developing 3 levels of Close Reading questions for each Journeys lesson. With Unit 1 in Journeys over with, I can safely say so far, so good! I'm excited about the difference I'm seeing between my fourth graders' written responses to grade level text between last year and this year. Of course no two groups are the same, but they are so much more focused and prolific, and their notebooks are much more organized. The way I approach the progression of questions I create for each lesson, is I think of Close Reading as the next generation of QAR questions. When I developed comprehension questions for each text, I started out with very basic questions about the text for the first Close Read that can really be answered in one word, such as the characters and the setting. For the second Close Read, however, they need "reasons," "evidence to support their answer," "details from the text," or "proof." Thus, they are seeing the language of the test every week. 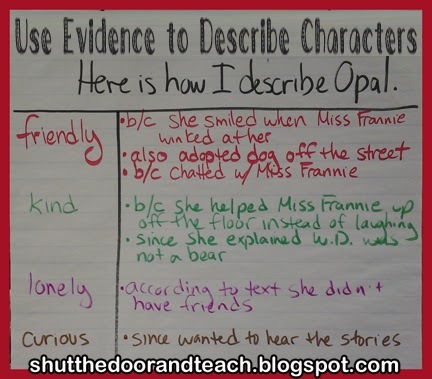 The "question" in a second Close Read is more of a prompt, such as, "Use details from the text to prove that Miss Franny was lonely." The answers to the question are "Right There" in the text, however I tell them the goal for answering is a paragraph (with a minimally accepted answer of 2 sentences). 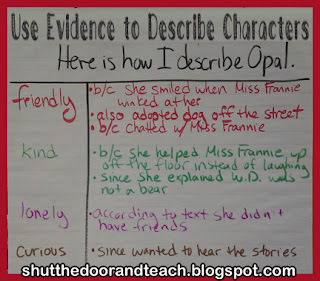 I used a text the kids had read earlier in the year as a model for teaching character traits. We used a list of possible traits as a scaffold to answer this prompt with opinions before looking for proof in the story. The result was kids were able to organize a variety of ideas about a character, as well as locate text based evidence to support their thinking! It is essential for parents to create a healthy learning environment for their kids. it is imperative as it nourish urge of reading and learning in kids at early stage...i am a single parent, having two kids. your article is very informative. my elder son has learn to read in early age n my younger daughter is in process. Homeschooling is important for enhancing positivity and creativity in kids.